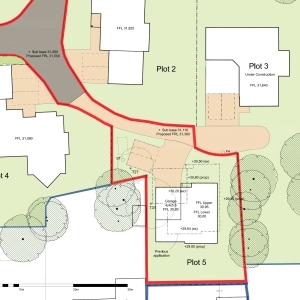 East Dorset District Council: Darryl Howells has won an appeal against the decision of East Dorset District Council to refuse planning permission to sever land and erect a four bedroom, detached dwelling with associated vehicular parking and pedestrian access, parking and secure cycle storage, tree protection and landscaping. The plans drawn by local architectural practice Williams Lester Architects was refused on the grounds of alleged overdevelopment of the site; lack of external amenity space; and harm to neighbouring occupiers. In Darryl’s statement, he strongly argued that the size of the proposed plot was consistent with the emerging character of the area compared to the historic larger plots which the Council placed greater weight as being the character. He convinced the Inspector that the size of the garden retained for residential occupiers would be sufficient and reminded the Inspector that the Council lacked any explicit policy in relation to the provision of outdoor space. In respect of alleged overlooking, Darryl successfully argued that the provision of first floor windows overlooking the bungalow and garden area to the rear would not be harmful due to the distance of separation. If you have been refused planning permission regarding any alleged overdevelopment or harm to neighbouring amenities, then contact Pure Town Planning and have one of our consultants to review the decision and advise on the best procedure to resolve the problems, either a revised application with planning arguments or appeal.